Shamsi Aghdasi Azamian (شمسی اقدسی اعظمیان), a Bahai from Gilavand, a suburb of Damavand (in Tehran Province), was buried in Gilavand Bahai Cemetery on October 24. Four days later her body was exhumed by unknown individuals and abandoned in the deserts of Jaban in the suburbs of that city. No individual or institution has accepted responsibility, although security forces had told the Gilavand Bahais earlier that they had no right to bury their deceased member in Damavand and that they should perform burials only in Tehran. Gilavand Bahai Cemetery has been the Bahai burial place for many years. A group of Iranian progressive intellectuals has issued a statement condemning this action. This is not the first time Bahais in Iran have faced the demolition of Bahai cemeteries in various cities. HRANA earlier has reported on the destruction of graves and the closure of Bahai cemeteries by judicial and security authorities in the past several years. Among Bahai cemeteries, one in the city of Kerman has been sealed since noon on March 15, 2018, by order of the Kerman judicial authorities, and the burial of deceased Bahais has been prevented. 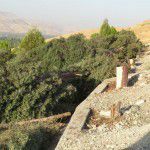 Also, on July 14, 2016, Ghorveh Bahai cemetery, in the province of Kurdistan, was destroyed by government agents. 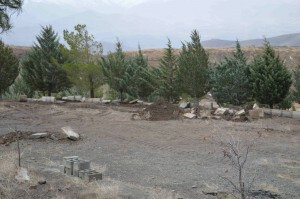 On December 12, 2013, after confirmation of a court order in Sanandaj and confiscation of the land belonging to the Bahais which had been used as a cemetery, the site was demolished by a bulldozer. In March 2014, the Bahai cemetery in Ahwaz was closed, and the alley leading to it was blocked by heavy cement blocks. No organization has accepted responsibility for this action. Also, in the middle of December 2012, Sangesar’s old Bahai cemetery was thoroughly covered in soil and rubble by bulldozers and trucks, and all the graves were covered by dirt and rocks, so that no more graves could be seen. Since August 2011, the Bahai community of Tabriz has not been allowed to bury their dead in this city, and their bodies are being transferred by intelligence officers to the city of Miyandoab, in West Azerbaijan Province. As previously reported, the ‘Golestan Javid’ (Bahai cemetery) in Kerman was closed by the judicial authorities on March 16 this year, preventing both visits to the graves and new burials. When an elderly Bahai man, Abbas Khalousi (عباس خلوصی), died on August 16, the authorities refused to allow him to be buried anywhere in Kerman, and held the body for four days before giving permission for him to be buried in a desert area near Rafsanjan, the capital of Kerman Province. The two cities are about 90 minutes apart. They summoned his son and told him to bury his father there, or they would take the body and bury him themselves. 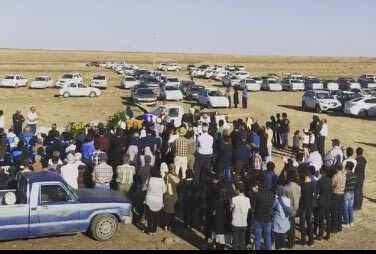 The result was that, on the day of the funeral, a large motorcade of cars sped from Kerman to the place of burial, with other cars coming from Rafsanjan and other places, and a well-attended funeral was held. The authorities’ obduracy resulted in a highly visible event proclaiming the presence of the Bahais in the two cities, and making their oppression by the authorities visible to all. But it remains the case that the Bahais of Kerman are banned from visiting and caring for their cemetery, which will inevitably become overgrown before being seized by the authorities for profitable development by a regime insider. The closure, destruction and vandalization of Bahai cemeteries has become common in Iran: many recent examples can be found on this blog by typing “cemetery” in the search box, or clicking on the category link “Burials and social matters.” For a discussion of the long history of symbolic violence directed at graves and bodies of Bahais and other in Iran, see Mehrdad Amanat, Set in Stone: Homeless Corpses and Desecrated Graves in Modern Iran (2012). Bahai World News Service, September 1, 2017. Some 2,500 people have gathered this morning at a conference to mark the historic dedication of the local Baha’i House of Worship in Battambang, Cambodia. The program also included remarks by several officials from the national and provincial governments as well as the architect and representatives of the Baha’i community. Iran Press Watch, December 7, 2016. Within the last two weeks government forces have “walled off” the grave sites from the surrounding buildings (which were previously confiscated), and on November 28, officials destroyed the building where bodies were washed before being wrapped for burial. A month earlier, officials told the Bahais of Birjand that they should leave the city and that they would have to take their dead for burial to Dastjerd, while the Bahais who live in the surrounding villages should bury their dead in their own villages, because this cemetery is close to the city. As previously reported on Sen’s Daily, the Municipal office of Ardestan demolished the gate of the Bahai cemetery there on November 6. Iran Press Watch, November 3, 2016. 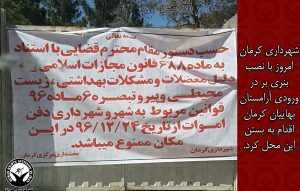 The Municipal office of Ardestan has demolished the gate of the Bahai cemetery. The report (on Gold News) does not indicate when this occurred. Because of restrictions on finding work and furthering their education, nearly all young and middle aged Bahais have moved to other cities; in particular to Isfahan. Some elderly women and men, along with a few middle-aged people, remain in the Bahai quarter, known as Bab ul Rahy, where they are deprived of basic municipal services such as garbage disposal. In August 2014, the authorities in Semnan introduced new rules for Bahai burials, one of which was that no wall could be built around the Bahai cemetery. It is not clear whether the removal of the gates in Ardestan is another indication of a new policy to prevent the Bahais protecting the graves of their loved ones, or a random act of vandalism. The full report on Iran Press Watch is available here. Iran Press Watch, translating Bahai News, July 17, 2016. 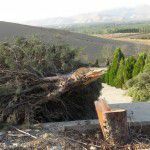 Law enforcement agents in Kurdistan province have demolished a Golestan Javid (a Bahai cemetery), uprooted over three hundred 20-year-old trees, destroying the buildings used for prayers and for washing the bodies before burial, and even destroying some coffins. The destruction apparently took place at 5 a.m. on July 14. Law enforcement agents later summoned one local Bahai, Mr. Khalil Eqdameyan (خلیل اقدامیان), to the Kurdistan Province Judiciary. A Persian source, Bazdasht, reports that when he answered the summons, he was detained for several hours and then released on bail. He had followed up the destruction of the cemetery in enquiries to the security forces, who referred him to the Department of Agricultural Development (Agricultural Jihad). The cemetery, which was built by the Qorveh Bahais little by little was worth 60 to 70 million tumans (approx. $19,400-22,700). The graves of nearly 30 Bahai martyrs who were executed by the Islamic Republic re among those that have been destroyed. The destruction of Bahai cemeteries has become a common occurrence in the Islamic Republic. Various sources, June 18, 2016. According to Gold News, on March 4 this year, a group of Bahais from Tabriz met with Ayatollah Tehrani to present a sampling of the indignities suffered by deceased Bahais in Tabriz over the past four years. The problems are experienced by Bahais throughout Iran. Bahais are buried in coffins with the graves oriented to Akka, in Israel, while Muslims are buried in shrouds, which require smaller graves that are oriented to Mecca. Separate cemeteries or separate sections are therefore a practical requirement, as well as being required by the existing anti-Bahai prejudices. Prior to the 1979 Revolution, Bahai ‘Spiritual Assemblies’ (elected bodies that administer the affairs of local Bahai communities) administered Bahai cemeteries, but many members of these local Assemblies, including eleven in Tabriz, were executed following the Revolution. In August 1981, the Assemblies were disbanded by the Bahais, on government instructions. Local and nation facilitators were appointed, in part as intermediaries with government bodies in matters relating to the Bahai community, but in March 2008, Mahvash Sabet, one of the national facilitators (Yaran) who had travelled to Mashhad to deal with a burial, was arrested. Two months later her six colleagues were also arrested, and local facilitators across Iran ceased serving as intermediaries with the government. The Iranian government therefore has a problem of their own making. The Bahais from Tabriz told Ayatollah Tehrani that since September 3, 2011, the burial of Bahais in Tabriz has not been allowed. The decision was apparently made by high-ranking government officials, but has not been publicized. As a result, Bahais have had to wash and shroud the bodies of those who have died at home in their own homes. Where Bahais have died in hospital, their families are sometimes not even informed, but buried unceremoniously by the authorities far from Tabriz, in the districts of Miandoab or Urumeyyeh. A distant grave is not only cruel for the family of the deceased, it is contrary to Bahai rites, which stipulate that a body should not be carried more than one hour’s travel from the town where he or she died. In the past few years, at least 35 Bahais from Tabriz have been buried in other districts in this way. Some of these events in Tabriz have been reported previously on Sen’s Daily. 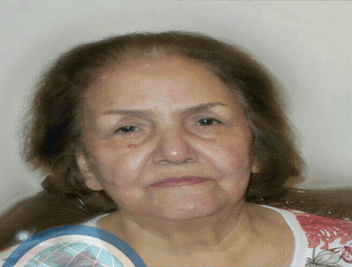 On June 13, 2016, Bahai News reported that the body of Mrs. Rezvanieh Nabavi Dehkharqani (رضوانیه نبوی دهخوارقانی) is still in the morgue at the Vadi-e Rahmat Cemetery in Tabriz, five days after her death, because authorities will not issue a burial permit. After she died on June 8 2016, her body was washed and shrouded in her home, and the Bahai prayer for the dead was read. Then her body was delivered to the morgue to await a burial permit. A later report indicates that the body was taken to Miandoab by government agents, and buried there. Bahai News (Persian, Facebook), January 18, 2016. Officials at the public cemetery in Tabriz, the Wadi-ye Rahmat cemetery, have impeded the burial of Mrs. Afruz Bakhshi (افروز بخشی), who died on Friday, January 15. Siamak Shafi`i (سیامک شفیعی), the son of Mrs. Bakhshi, who is at present in Washington, told Bahai News that officials at the cemetery in Tabriz had been refusing to bury Bahais since 2012. In September 2015, a national policy was announced, that Bahais may only be buried in one designated cemetery in each province. After the death of his mother, his father washed the body in his own home. Washing the body in a prescribed manner is part of both the Bahai and the Muslim burial rites, and is normally done in a separate washing facility on the cemetery land. Mr. Shafi`i said that he knew it was not appropriate to wash the body in the home, for psychological and health reasons, but his father and the family had no choice, as they did not wish her to be buried according to Islamic rites. or the performance of Bahai rituals, so the family should bury her according to Islamic rites, without the coffin. Alternatively, they could take the body to the Bahai cemetery of Urumiyyeh (aka Urmia or Orumiyeh). This isolated cemetery was vandalised in August, 2015, and it is two hour’s travel from Tabriz. The Bahai practice is to bury a body within one hour’s travel of the place of death. The officials also suggested taking the body to Miandoab, which is two and a half hours by car from Tabriz. The cemetery officials also offered to conduct the burial themselves (i.e., according to Islamic rites). The body was placed in the morgue. Mrs. Bakhshi’s husband approached various local authorities in Tabriz, but was told that the policy comes from “higher up.” When he returned empty-handed to the cemetery in Tabriz, the cemetery officials said that they would take the body to a cemetery site specifically for Bahais in Miandoab on Monday, January 18. Mr. Siamak Shafi`i said that the “Miandoab” cemetery is actually closer to Mahabad, which is three hours from Tabriz, and is a rocky place, so that a bulldozer is required to dig a grave, and the Bahais would have to travel more than two hours to take each body. The Bahais were allocated a separate cemetery so that Muslims would not be buried alongside Bahais [and also to remove the Bahai presence from a public space ~Sen]. Mr. Shafi`i said that when the bodies of deceased Bahais are taken to the “Miandoab” cemetery by city officials, their families are told they have been buried, and in some cases the Bahais know that the deceased were buried with Islamic rites. He said that officials had been doing this for more than four years now, and 47 Bahais have been buried in this way. Five years previously, his wife’s grandmother died, and become the Bahai to be excluded from the cemetery in Tabriz. In past years [when the Bahai community in Iran was allowed to organise its affairs], his father was one of those responsible for washing and burying deceased Bahais. After the 1979 revolution in Iran, and especially in 1987, the family, who were then living in Ilkchi, suffered attacks by ‘extremist forces’ and their possessions, land and house were expropriated. Bahai News (Persian, facebook), December 22, 2015. Nine Bahais who were detained during two house raids in Marvdasht on December 19 have been released after undertaking not to meet one another at night or have dinner parties. MAF News, December 10, 2015. In the past week, at least 15 Muslims in Kermanshah have been summoned to the Ministry of Intelligence and questioned and threatened because they have associated with Bahai families in the province. They were told they should not have any links to any Bahais. In the city of Sanandaj, capital of the neighbouring province of Kurdistan, officials refused to register the marriage of a Bahai woman with a non-Bahai man. 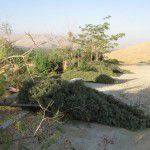 A number of 20-year old trees in the Bahai cemetery of Urumiyyeh (Urmia) have been cut down with a chainsaw. The destruction apparently happened on July 25, 2015. 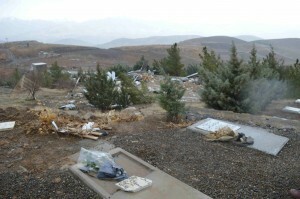 This is the first time that this cemetery has been targetted by the vandals, although trees have been cut down in the Bahai cemeteries of Marvdasht, Sansgar and Isfahan. In Isfahan, some 2500 trees were cut down October 2008, and in Marvdasht, 1200 were cut down in April, 2011. Bahai News (facebook), August 13, 2015. The Islamic Revolutionary Guard Corps of Fars Province has continued to prepare the site for the cultural, sporting and commercial centre it intends to build on the Bahai cemetery of Shiraz. New burials in the cemetery were forbidden in 1984, soon after 10 Bahai women who had been hung by the government were buried there. In all, the cemetery held the remains of 23 Bahais martyred for their faith, following the 1979 Iranian Revolution. However the cemetery had been in use for nearly 70 years, and contained 950 graves, of which nearly 400 have now been desecrated by earth-moving machinery. The IRGC has chosen to build on the cemetery, although there is a large empty site adjoining it which would be suitable. When the destruction of graves began, there was an international outcry, and the destruction was limited to one area in the cemetery, although the building work continued. However the latest photographs show that work is underway on most of the site’s 16,000 square meters. The Bahais of Shiraz have attempted to discuss the matter with religious and civil authorities, and some have even gone to Qom [to meet senior religious figures there ~sen], but without results. On August 5, 2014, three Bahais were arrested in Shiraz, apparently because they had sought to discuss the destruction of the cemetery with the responsible authorities. On June 14 last year, the head of the IRGC in Fars Province held a religious ceremony on the site, to mark the “night of power,” and used the occasion to insult and threaten the Bahai community. On 12 July 2015, a Baha’i, Mrs. Baji Muhammadifar passed away and her family sought a burial permit to inter her body in the Bahai cemetery in Sanandaj. This was refused, with the officials insisting that Mrs. Muhammadifar’s body be laid to rest in the Baha’i cemetery in Qorveh, a town located approximately an hour and a half from Sanandaj. Agreeing to burial in Qorveh would have forced the family to ignore the Bahai burial law requiring bodies to be interred within an hour’s journey from the place of death. The authorities told the family that an ambulance—which could exceed the speed limit—would carry the body. Local authorities sympathetic to the plight of the Bahais told the family that a memorandum from the Supreme National Security Council has stated that the Bahais are only to be allocated one cemetery in any province. This rule is not applied to any other group in the country, and was not previously known to the Bahais. “The Iranian authorities seem to have brought themselves down to a new level of absurdity and malice; extending their prejudiced attacks on the Baha’i community beyond the grave,” said Bani Dugal, Principal Representative of the Baha’i International Community Office to the United Nations in New York. The refusal to allow the burial to take place in the Baha’i cemetery in Sanandaj, an area made beautiful and verdant through decades of effort by the community, meant that the family had to keep the body of their loved one in cool conditions at home. The family knew that if the body were in the public morgue, it would be taken by the authorities without their knowledge or permission and buried with no Bahai rites [as has happened in other cases in Iran ~ Sen]. Members of the wider community who came to mourn Mrs. Muhammadifar’s passing were most sympathetic to the family’s situation. There was a swell of public support in the town, with attention being drawn to the unreasonable behavior of the authorities. Officials responded by summoning the son of the deceased for interrogation. After four hours of grueling questions and threats, he was forced to give up his mother’s body. Soon after it was taken in an ambulance, unaccompanied by any family member, to Qorveh cemetery. Iranian law requires every town to provide, within its boundaries, cemetery plots for the burial of all its citizens and makes it unlawful for a municipality to accept for burial bodies from outside its jurisdiction. Abbreviated: full report in English here. Campaign against harassment of Bahais (Persian facebook page), July 16, 2015. Government authorities are reported to have buried Mrs. Baji Khanom Muhammadi-Far (باجی محمدی فر), a Bahai from Sanandaj, in the Golestan Javid cemetery in Qorveh. The name of this cemetery (the same as the one in Sanandaj) suggests that it is a Bahai cemetery. When Mrs. Muhammadi-Far died on July 12, authorities refused permission for her to be buried in the “Golestan Javid” cemetery in Sanandaj. It is not clear whether this refers to the Bahai cemetery which was razed by local authorities in December 2013, or a new piece of land that has been acquired as a Bahai cemetery for Sanandaj. The latest report is that authorities have buried Mrs. Muhammadi-Far in Qorveh against the wishes of her family. Qorveh is about 94 kilometers East of Sanandaj, over a mountain pass at Salavatabad. Not only is the distance a burden for the family, Bahai burial rituals require that the grave should be within one hour’s journey of the place of death. The cemetery at Qorveh does not satisfy this requirement of the Bahais of Sanandaj. The authorities in Sanandaj had previously threatened the family with arrest, and said they would bury Mrs. Muhammadi-Far in Qorveh without any ceremony. Mrs Muhammadi-Far is also known as Mrs Sadeqi (خانم صدقی). Bahai News (Persian), July 15, 2015. As previously reported, when Mrs. Baji Khanom Muhammadi-Far (باجی خانم محمدی فر), a Bahai living in Sanandag, died on July 12, authorities refused permission for her to be buried in the Golestan Javid cemetery, sending 50 security agents to surround the cemetery and prevent the family and Bahai community performing the burial. Three days later, authorities are still refusing to issue a burial permit, and the family’s questions have gone unanswered. Moreover the body of Mrs Muhammadi-Far has not been allowed to enter the cool storage at the morgue. It is being kept, packed in ice, in a private home. These decisions have apparently not been taken by local officials, but at some higher level. The present news makes it clear that when they sent the security agents, the authorities were not objecting to the possibility of a large Bahai funeral, but rather to the presence of a Bahai body in the morgue or cemetery. According to a primitive superstition which is widespread among the majority Shiah community in Iran, the Bahais, Zoroastrians and some other people — whether living or dead — are believed to be ‘unclean’ and able to contaminate ‘pure’ (Shiah) people. 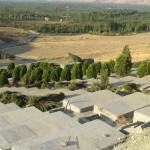 In the past, the Bahais in Sanandaj have had separate cemeteries with facilities for washing the bodies, but these cemeteries have been confiscated and destroyed three times by the local authorities, most recently in December, 2013. Bahai News (Persian), July 13, 2015. The planned funeral of Mrs. Baji Khanom Muhammadi-Far (باجی خانم محمدی فر) in the Golestan Javid cemetery in Sanandaj yesterday was blocked by a force of 50 uniformed and plain-clothes police officers who surrounded the cemetery. The local government has refused to discuss complaints about the actions of the security forces, saying that the decision was not made at a local level, and they could not say anything. The Muhammadadi-Far family come from the village of Sisan, in the Tabriz area. The town had a Bahai community numbering about 500 before the 1979 revolution, but arson, looting and official persecution has forced many of them to move to other towns, such as Sanandaj. 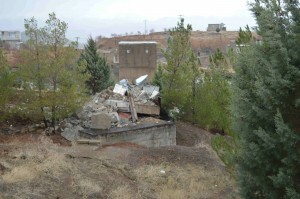 In December 2013, the Bahai cemetery in Sanandaj was destroyed by local authorities. That was the third Bahai cemetery in Sanandaj to be erased since 1979. For a discussion of the long history of symbolic violence directed at graves and bodies of Bahais and other in Iran, see Mehrdad Amanat, Set in Stone: Homeless Corpses and Desecrated Graves in Modern Iran. Officials at the public cemetery in Tabriz, the Wadi-ye Rahmat cemetery, have refused to allow the burial of Mr. Maruwati (مروتی), a Bahai from Tabriz who died on March 20, 2015. On the morning when Mr. Maruwati died, his family took his body to the cemetery for burial. The officials concerned told them to take the body to the morgue at the cemetery, and to wait at home until they were contacted. A few hours later someone from the cemetery telephoned, to say that permission for burial had been denied, and the body had been taken to the town of Miandoab for burial. For the past 18 months, Bahais have not been accepted for burial in Tabriz, and the bodies have been taken to the towns around the city to be buried, without informing the families. The families of the deceased have sought a meeting with Mr. Jalali (آقای جلالی), head of the public cemetery, but so far he has been unwilling to meet them or hold a discussion. The body of a Bahai has been held in the morgue for nearly two months in the large southern Iranian city of Ahvaz because local officials have refused to allow his burial. Shamel Bina passed away on 28 October but remains unburied, despite numerous appeals from his family and others, who have appealed to numerous officials from the governor general to the city’s Friday prayer leader. The family’s agony is compounded by the fact that, earlier this year, the Bahai cemetery here was closed by authorities. The door to the walled compound was welded shut and bricked up. The episode is the latest in a series of incidents in recent months where Iranian officials have blocked or interfered with the burial of Baha’is – or sanctioned the destruction of their cemeteries – apparently as part of a campaign to force Baha’is to deny their own religious identity. Mahna Samandari (مهنا سمندری) and Narges Khatounbarqi (نرگس خاتون برقی), two Bahais from Tabriz whose burial in the city has been blocked because of their religious beliefs, have been taken to Miandoab by local officials and buried in the Bahai cemetery there, without informing the families of the deceased. The burial took place on November 13. Mahna’s body had been held in a mortuary in Tabriz for 24 days, while the body of Mrs. Khatounbarqi had been held for 5 days. Bahai burials in Tabriz have been limited since early this year, and officials have been burying the bodies in Miandoab and Urmia (Urumiyyeh) without informing the families. The family of Narges Khatounbarqi (نرگس خاتون برقی), an 85-year old Bahai who died in her home on November 7, have been barred from burying her in the general cemetery in Tabriz, the ‘Valley of Mercy’ cemetery. The family took Mrs. Khatounbarqi’s body to the cemetery on the day after her death, but the officials at the cemetery balked because she was a Bahai, saying she could only be buried there in accordance with Muslim rites. Otherwise, the body would be kept in the mortuary until Tuesday (November 11), and then would be taken for burial in Miandoab, along with the body of twelve-year-old Mahna Samandari (مهنا سمندری), which has been held in the mortuary for the past three weeks. The officials justified their decision first by reference to regulations and then on the basis of Islamic law and the wishes of the Shiahs. Yet two sisters of the deceased are Shiah Muslims, and they requested that their sister be buried in the “Valley of Mercy’ cemetery. The recent burial of a Bahai in Semnan, in the section of the cemetery reserved for Bahais, has revealed that new rules have been drawn up. The family of the deceased was required to sign a commitment to follow six rules. These stipulate that the Bahai gravestones may only show a name and the dates of birth and death, that the Bahais may not beautify the area around the graves with plants or build a wall around the Bahai cemetery, or erect new buildings around the facility where bodies are washed, that they may not have any words or images on the graves or in the cemetery, and that the Bahai gravestones must be level with the ground, without any raised portions.